Last Saturday, to celebrate the start of a new Rotary year, 200 people packed the theatre at Tudor Hall School, and witnessed a “West End” concert. 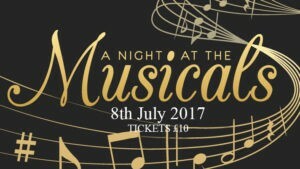 Simon Adkins (originally from Banbury and currently the resident choreographer of 42nd St in the West End), Alison Dormer & Clare Rickard accompanied by Rob Cousins performed a wide and varied range of songs from the Musicals, many of which the three have performed in during their time as Musical Theatre professionals. 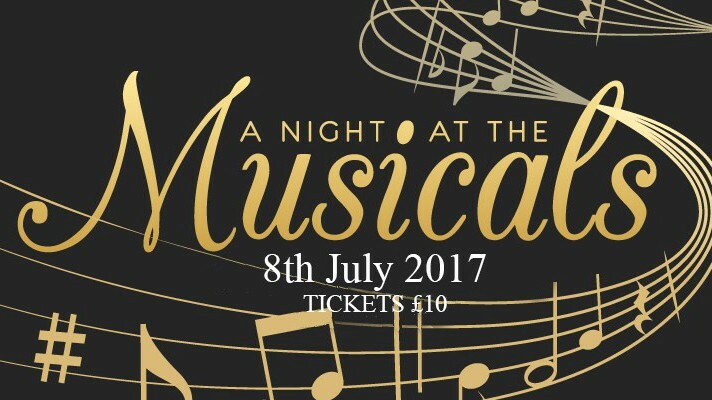 Newly installed President of Banbury Rotary Club, Alan Wolstencroft, who was instrumental (pardon the pun) in setting the concert up stole a line from Jersey Boys (Simon was in the original West End cast) and said “Oh What a Night”! 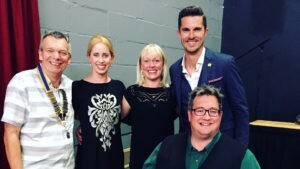 All four performers donated their time, appearance fee and expenses to support Banbury Rotary Club’s concert which was raising funds for Alan’s Africa Sierra Leone schools projects and Rotary’s End Polio Now campaign. 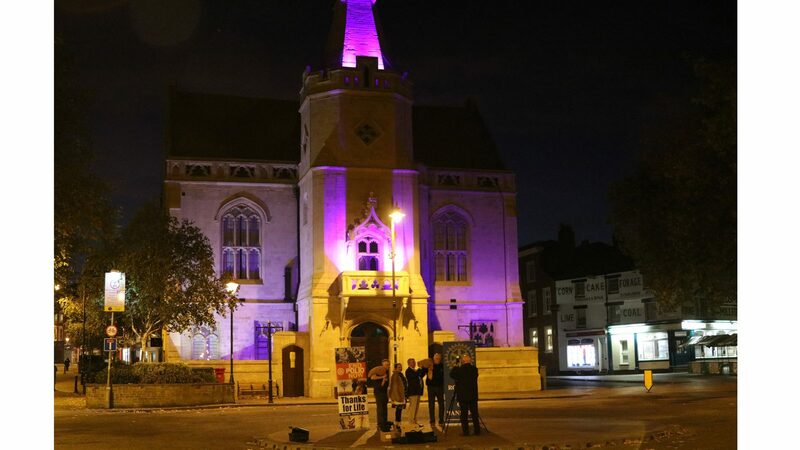 Simon said “it was great to be back in Banbury, seeing family and friends, performing with three great people and helping Alan & Rotary raise funds for two great causes”. Alan said “Rotary’s theme this year is “Rotary – Making A Difference”. The concert was a great way to start my year as President and I owe an immense debt of gratitude to the four professionals for putting on such a great show, and giving freely of their time, and I must also acknowledge the wonderful support we received from Tudor Hall School and the local businesses who donated items for the raffle and auction”. (with kind permission of the Headmistress, Wendy Griffiths). Sir Charles Pollard has been an eminent figure in policing, both nationally and internationally, and still works in the Justice system today. Retiring in 2002 from Thames Valley Police, the largest non-metropolitan police force in the country, he had earlier progressed through the middle police ranks in London and Sussex during one of the most turbulent periods of recent history, during which time he was personally involved in many of the key policing events:. Sir Charles began his career at the age of 19 in 1964 as a constable in the Metropolitan Police and was selected for the ‘fast-track promotion course’ at Bramshill Police College. From there he took an LLB at the University of Bristol. Through the 1970s and 1980s he pursued an eventful and successful policing career in London and Sussex and in 1991 was appointed Chief Constable of Thames Valley Police, covering 3 counties with a population of over 2.5 million. The talk will include, among other things, his personal experiences of the policing of public disorder, crime and terrorism. We look forward to welcoming Rotarians, local Parishioners and the General Public. 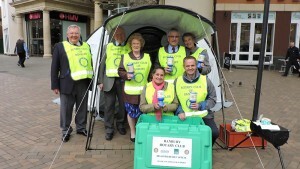 Thank you so much Banburyshire folks for your generous donations last Friday to help send Shelterboxes to Nepal, etc. 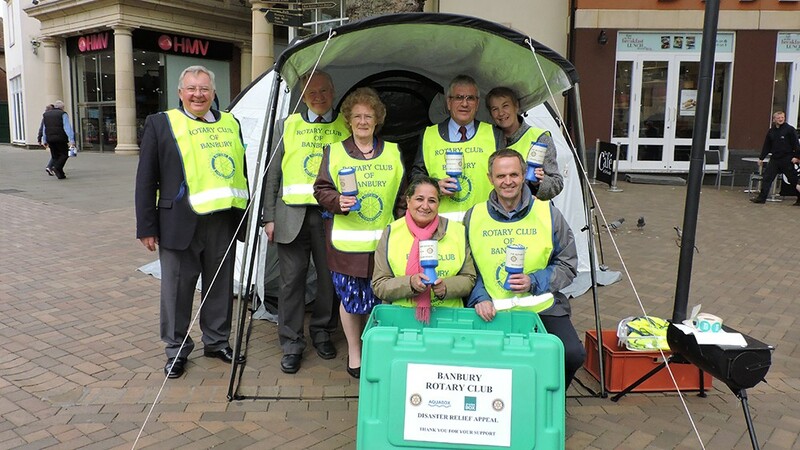 £1795 was raised from our street collection in Banbury town centre which is a fantastic result and will make a real difference to those needing our support. We were even joined on the day by Peter King, RIBI President, and his wife, and also Tim Cowling, District 1090 Governor and his wife. Monday 23rd February, and Fred Riches and Alan Wolstencroft braved the cold in Greenwich, but the sun was shining and just a few clouds in the sky as the first group gathered in the anteroom to watch the safety DVD before donning our safety gear – jacket, shoes, harness and link which we needed to attach to the chest-level wire that’s mounted beside the canvassy, bouncy walkway that leads up to the top viewing platform and down the other side. We hadn’t realised the Dome measurements and positioning were all planned in relation to time. It’s 365 metres circumference and 52 metres in height, with twelve of those spikes sticking out – and all as close as possible to 0 degrees longitude. We were a group of about 16 with a leader. The first bit goes up a one in three slope, so you’re digging your toes in and leaning forward while pushing the link along the wire with one hand and holding on to another safety wire/rail with the other. Then it evens out gradually till you reach the top. There you’re allowed to unchain yourself and look around on all sides of the viewing platform. Highly recommended for the summer! Brilliant views over the Thames and across London. However, the weather decided to do the dirty on us and just as we reached the top a large black cloud chucked a mixture of sleet and hail at us through the rising gale. I have a lovely video of two ladies who helped organise the event reading a congratulatory message from a leading international Rotarian. Picture’s great. Sound = loud crackling wind… Hey ho! Then it was back onto the wire link for the clamber down, perhaps the most strenuous bit, because the last bit is one in three slope as well and pulls on your thighs while you try to keep your balance. Overall a really good experience – and thank you very much for helping use reach our sponsorship targets. 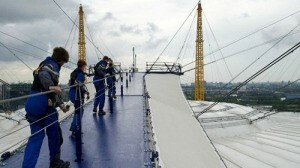 Two of our intrepid members, (Fred Riches and Alan Wolstencroft), will be walking the O2 Dome to mark Rotary Day and raise funds for good causes. 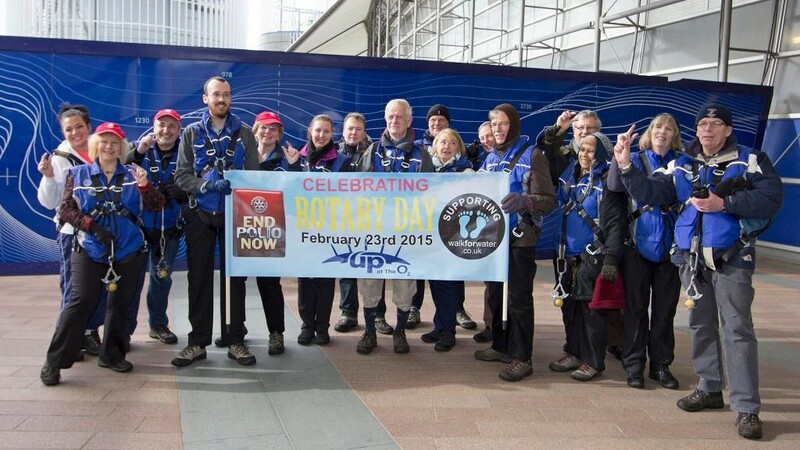 February 23 marks the 110th anniversary of Rotary and our two colleagues will be raising funds for the “Roll Out The Barrel Trust” (www.rolloutthebarrel.org), the Rotary End Polio Now campaign (www.endpolio.org), and our Sierra Leone School projects. 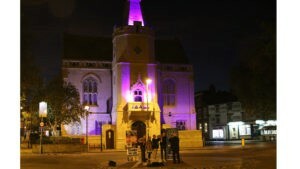 You can sponsor them on the Just Giving (https://www.justgiving.com/Fred-Riches) & Virgin Giving Money (http://uk.virginmoneygiving.com/fundraiser-web/fundraiser/showFundraiserProfilePage.action?userUrl=alanwolstencroft), websites. 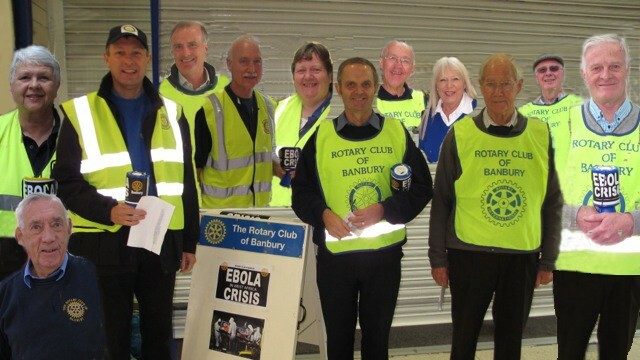 The Rotary Clubs of Banbury and Banbury Cherwell are combining with the Marlow Club to address the desperate situation in West Africa. 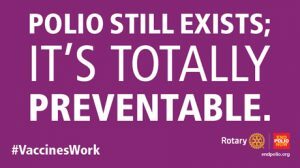 They are working with the Rotary Club of Monrovia in Liberia where already thousands of people have died in the Ebola outbreak, and the number has continued to rise. Liberia, followed by Sierra Leone, are the worst hit countries. The crisis has led to panic, rioting and fear. The hospitals are not equipped to cope; many have no gloves, no masks, no fresh water, even Doctors are dying! The Rotary Club of Marlow, have been in touch with the Rotary Club of Monrovia, Liberia’s capital city. They have commenced action with vigour, good sense, and with a real knowledge of what is needed. They found, can you believe, that the largest hospital in Monrovia had not even one standard Ebola protective garment. By August 16th, the Rotary Club of Monrovia have given local hospitals 3000 surgical gloves, 10,000 examination gloves, 100 buckets with faucets, and petrol slips for the rapid response vehicles. 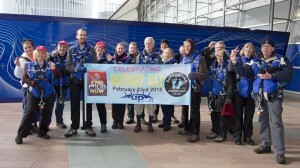 Further, they have embarked on a global campaign to raise USD $100,000.00 for this cause. They are engaging with local churches to raise funds, and to distribute the required items. The Collection at Castle Quay Shopping Centre on Saturday 11th October raised £741.24 and we would like to thank the people of Banbury for their generous donations. 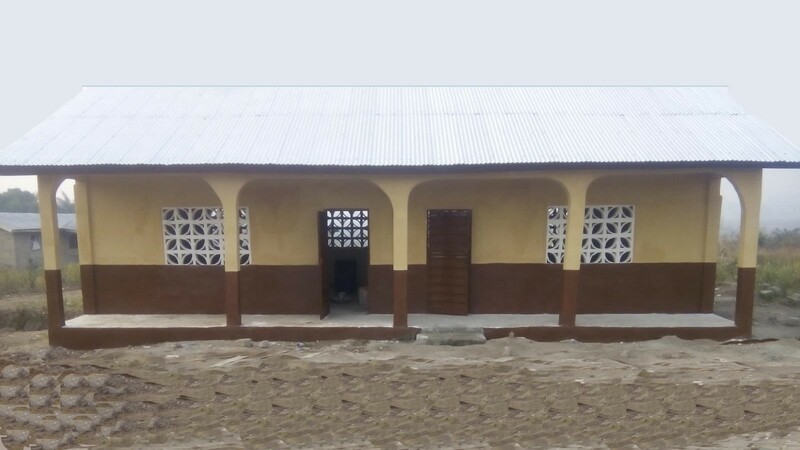 Almost £20,000 has been raised by Rotary Clubs in District 1090 and all the money will be passed to the Rotary Club of Monrovia.